Published: Dec. 17, 2017 at 04:26 p.m.
Buffalo Bills cornerback Tre'Davious White intercepts Miami Dolphins quarterback Jay Cutler to end the game. Published: Nov. 26, 2017 at 04:34 p.m.
Buffalo Bills rookie cornerback Tre'Davious White seals the game with this late interception. 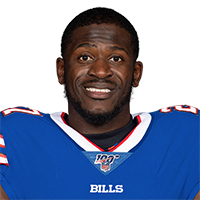 Published: Oct. 22, 2017 at 04:11 p.m.
Buffalo Bills cornerback Tre'Davious White punches for the football and forces a fumble to immediately get the ball back for the Bills in a tie game.